What makes us Canada's #1 Resume Writing Company? Here are the facts that make us #1. We are not ONLY claiming it; we are providing the PROOF. 1989 - Resume World was first established as a Sole Proprietor Resume Writing Company in Toronto, Canada with a single purpose— to create outstanding resumes for clients that get them into the doors of Top Employers. 1990 - Resume World established its Corporate Head Office at Aldgate Corporate Centre, 1200 Markham Road (at Ellesmere) in the Borough of Scarborough, now the City of Toronto. 1990 - Resume World was incorporated under the Laws of the Province of Ontario, Canada in October 1990. View Corporation Registration. 1992 - Resume World opened its second location at 2610 Weston Road (at Hwy. 401) in North York based on growing market demand for its resume writing expertise and to serve clients west of Toronto. 1994 - Resume World opened its third location at 5635 Young Street (at Finch Avenue) in Toronto based on client success and the need for a central office to support business growth and client needs. 1994 – Resume World standardized the resume writing process and developed the first Resume Writing Certification program. This step was taken after much research in both Canada and the U.S. to locate and join an existing Resume Writing and Career Association. Since no association existed at the time, Resume World then streamlined and documented its own in-house resume writing and client consultation process and created an accreditation process and code of conduct for all employees to follow across its three locations. Subsequently, each and every employee hired by Resume World must go through and pass this rigorous certification program to become a Resume World’s certified writer. Upon completion of this process, employees are then provided with additional on-the-job training on a yearly basis so they can deepen and broaden their writing expertise and job market knowledge in order to deliver continuous value to our clients. 1994 – Resume World celebrates 5 years in business with a strong roster of clients from across 30 plus industries. With the completion of our “five years" of successful resume writing, our team of professional resume writers have written 14, 856 resumes and amassed a diverse client-base consisting of mainly professionals (engineers, accountants, doctors, lawyers, teachers, etc.). 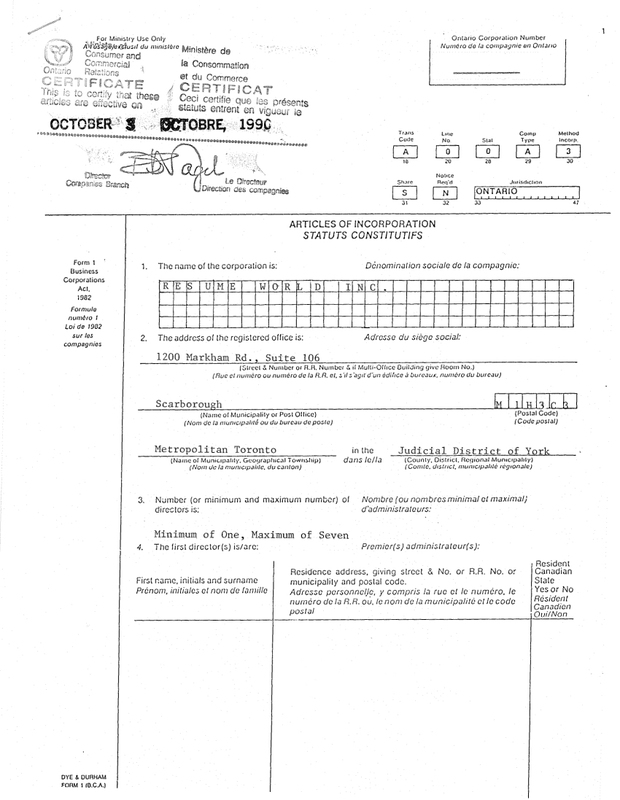 During the early 90s, most candidates filled out company-specific employment forms/applications to apply for jobs. Employers those days (especially SMB companies) would interview candidates on the spot, even without a resume. Today, every company regardless of size asks to see your resume before granting a job interview. 1995 - Resume World applied to the Canadian Intellectual Property Office for the rights to use the name "Resume World" as its corporate trade name and logo as its trademark. 1997 – Resume World successfully obtained the rights after two years to use the name “RESUME WORLD” as its corporate trade name and logo as its “TRADEMARK.”Resume World was granted the exclusive rights to use such trademarks by the Canadian Intellectual Property Office. 1998 – Resume World established its presence on the World Wide Web (Internet). With this action, Resume World became the very first Resume Writing Company on the Internet. Our website provided candidates with “much needed and hard to find resources” on resume writing strategies and resume tools such as templates, formats, worksheets, and tips. Check out our initial website at the Internet Archive, type in www.resumeworldinc.com. 1999 - By the end of our “first successful decade” in business, we have written over 40,000 resumes and started to develop a rapidly growing “global” clientele consisting of professionals from just about every occupation and position-level – from new graduates to senior executives. 2000 - Resume World changed its corporation type to a Canadian Federal Corporation in order to obtain the .CA domain, www.resumeworld.ca.At that time, a company needed to be federally incorporated, a mandatory requirement of the Canadian Internet Registration Authority (CIRA) for any business wanting to use the country’s CA (dot-ca ) domain extension. Today, it is not mandatory to be a Canadian Federal Corporation for a business to obtain the .CA extension. 2002 – Resume World’s affiliated corporation, Hire A New Grad was formed. At a time when graduates were facing severe difficulty entering the job market, this website provided much-needed tools (free of cost) for new and recent graduates to link directly with employers on a nationwide basis. 2003 – Resume World was the first Resume Writing Company to officially Partner with the National Job Fair & Training Expo, providing 1000s of job seekers with much needed resume resources and tools, including professional resume writing guidance. 2004 – Resume World’s associated company—Talcura Corporation was established. Talcura was conceptualized and developed to provide leading edge hiring technology allowing large companies to manage their recruitment process globally and in real time. 2005 – Resume World’s associated company—Talcura Corporation (a leading HR software company), developed and launched a revolutionary Recruitment Software for the Executive Search/Employment Agency industry. The Software is used to automate the resume collection, candidate selection and job posting processes allowing recruiters, hiring managers and HR professionals to manage the entire recruiting cycle—from candidate point of contact to hire to new employee on-boarding. 2006 – Resume World’s associated company—Talcura Corporation developed and successfully launched a groundbreaking Corporate Recruitment Management Software (also known as Talent Acquisition System and Human Capital Management System) to support the corporate-wide hiring needs of large, geographically distributed organizations. 2008 – After 16 years of successful operation, Resume World amalgamated its 2610 Weston Road operation with its Head Office’s operations to serve a rapidly growing, global client base from a central location. 2004–2009 – Resume World, through its associated company, worked with 100s of corporate recruiters, hiring managers and human resources professionals of large U.S. and Canadian companies to customize and implement the Recruitment Software to meet their recruitment process needs. Leading employers such as Canada Pension Plan Investment Board, Grand & Toy, Winners, Hyundai, SonyBMG and Bayer Pharmaceuticals use the Software to screen and manage large volumes of resumes, post jobs to major job boards (Workopolis, Monster, CareerBuilder, Jobboom), track candidate activities, and manage the entire recruitment workflow to meet their talent acquisition needs. 2009 – Resume World formed a strategic alliance with a leading Global Psychometric Assessment Company to provide validated career diagnostic and assessment tools to clients and job seekers at large. These tools support both clients and job seekers to identify rewarding careers that match their professional interest and pave the way for further career growth and advancement throughout their work life. 2010 – Resume World successfully launched its new Web 2.0 Portal. This new web portal delivers advanced Web 2.0 functionality with enhanced benefits to users, and features a significant amount of resume tools and resources to support job candidates throughout the job search process. This new portal also reinforces Resume World’s strong brand and provides historical details that highlight the Company’s beginning and accolades as an industry leader. The information provided clearly sets Resume World apart from others in its industry, and enables existing clients and job seeking candidates to quickly find necessary resume services, information and tools. 2011 - Resume World, in partnership with a number of resume writing experts and career professionals, published a number of resume book products through the Smart Resume Products brand. These resume book products include Accounting & Finance for 6-Figure Jobs; IT Consulting for 6-Figure Jobs; and Technology Executive Resume for 6-Figure Jobs. 2011 – Resume World launched Smart Resume Products, a subsidiary company providing a lower cost, professional resume solution to career-minded professionals and job seeking candidates worldwide. Smart Resume Products are Profession-Specific Ready-to-Use Master Resumes in both digital and physical forms spanning 40 plus professions and over 500 positions and roles. Each profession-specific resume product is designed to enable job candidates to quickly and easily generate a top notch, job-targeted resume, saving substantially on cost and time. Everything you will ever need to easily generate an outstanding resume is included in each Master Resume—from Professional (Career) Summaries to Areas of Expertise, Key Job Responsibilities/Functions to Accomplishments and multiple Resume Templates; all in a 6 to 20 page resume document. The Master Resume is in Microsoft Word for quick access. Download the Smart Resume of your choice, review, modify and use—it’s that simple! These Profession-Specific Resume products can be purchased at www.smartresumeproducts.com or www.amazon.com. 2012 – Resume World successfully launched 10 more profession-specific “Master Resumes” to help job candidates easily build top notch resumes just like a professional writer, and save hundreds of dollars in professional writing fees. We have created “Winning Resumes” for just about every profession—whether you are in the Information Technology, Accounting/Finance, Human Resources, Hospitality, Healthcare, Banking, Applications Development, Sales/Marketing, Logistics, Technical Support or Customer Service field—we have created each “Master Resume” to uniquely reflect the skills, experiences, accomplishments and knowledge of that specific industry, and moreover, to fit the requirements of just about ever job within that profession. So, download your winning resume at SmartResumeProducts.com. 2013 – Resume World has ended 2013 with record breaking success—having written 3,000+ job winning resumes and other career-focused marketing documents for clients worldwide. Over 90% of clients reported that they have had multiple job interviews within weeks of submitting their resumes to potential employers. This year’s result again attests to the value that Resume World delivers to its clients. Recognized as the #1 Resume Writing Company, Resume World again delivered a number of resume writing workshops/training to large groups of displaced employees and graduating students across government, educational and private sector organizations. These workshops benefited hundreds of job seeking candidates and provided them with the most current resume writing strategy, tools and techniques to market their experiences in an impressive manner to win interviews and land the job in a much shorter time frame. 2014 – Resume World to celebrate its 25th year in business.There is much excitement brewing at Resume World as we are approaching our 25th anniversary in September of 2014. Stay tune for announcements on a number of special events coming up all through 2014 to celebrate our 25th year as the #1 Resume Writing Company for career-minded individuals across the globe. 2015 - Resume World has completed a significant milestone: quarter of a century in business. The Company began 2015 with a phenomenal track record with the completion of 150,000 powerfully written resumes which supported its clients in achieving their career goals. We continue to contribute (on a daily basis) to our client career success by creating the level of personal branding/marketing tools (resumes, cover letters, professional bios, LinkedIn profiles, admission applications to graduate schools and other career development documentation)—enabling them to not only land better jobs, get new promotions and grow their careers, but also more importantly, to increase their earnings and job satisfaction level. 2016 - Resume World has launched a number of personal branding websites for some of its Senior Professional Resume Writers, including Joseph Jagmohan, Angela Hill and Sandra Lallman. These personal sites serve as a bio by providing a detailed overview of each writer's professional background, level or resume writing expertise and client testimonials and their success stories. Also, you can travel through our 25 Years of Successful History, read about our significant milestones/accomplishments, resume screening software development expertise and industry leadership, spanning over quarter of century - 1989 - 2016. 2016 – 2017 Resume World parent company Hiring Soft Inc., a Canadian HR Software Consulting firm announced the sale of its equity interest in Talcura Technologies back to the company after a seven year hold of its common stocks. Hiring Soft continues to be a key player in talent management, resume screening technology and workforce automation, while Resume World delivers career management services to clients globally. 2018 Resume World subsidiary company, HiringSoft Inc (formerly Talcura Corporation). a leading HR Software and Systems Consulting Company, specializing in enterprise-wide talent management & workforce software acquisition, implementation, configuration, data integration and custom systems development and project management—officially completed the sale of its outstanding shares to Talcura Technologies Inc. in a mutual agreement between the companies. Talcura develops, markets and delivers a Suite of Software Products that helps companies drive people performance through talent acquisition, recruitment management and employee onboarding process automation.